Are you looking for the item set Tal Rasha's Elements? Tal Rasha was a powerful Horadric mage and leader of the Horadrim who sacrificed himself to forever encapsulate Baal in the dunes of Aranoch in the Tomb of Tal Rasha. Points where Tal Rasha's face seems to be attached to Baal's. It would appear that Baal acquired Tal Rasha's intelligence , since in the Sin War Trilogy, Baal is described to be brutish, but in the opening Lord of Destruction cinematic, he seems to be rather playful and sly. We don't know much about his appearance or personality other than that many of his peers saw him as powerful, selfless, and some even foolish in his selflessness. The one clue is Baal's face. Looking at Baal's face here to the left you can see Baal has in fact stretched Tal Rasha's face on top of his own demonic visage. The Binding Stone with Tyrael there after Baal was freed. 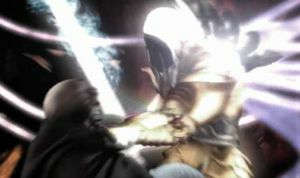 Tyrael & the Dark Wanderer battling. As Baal was defeated at the Worldstone, Tal Rasha's body is presumed to be destroyed. Tal Rasha is primarily a part of ancient history in the Diablo universe, but he does a few short appearances in Diablo II, both when he's showing Marius the sight of Baal as a human in pain and after he's freed, where we can see Baal's face covered with the skin of Tal Rasha. There are also the items belonging to the Horadric mage as well as what other NPCs think. Mural of Tal Rasha in his tomb. Tal Rasha's Wrappings item set. "Remember this: Baal once possessed Tal Rasha, one of the most powerful of the ancient Horadrim. Your battles with Diablo and Mephisto will pale in comparison to your battle with Baal. The Lord of Destruction, aided by Tal Rasha’s knowledge… Ungh, the mountain itself will tremble when you clash!" Two other Act II NPC's are not quite so supportive of Tal Rasha's decision however. Fara tells us that "his was a selfless act, although perhaps foolhardy." and Lysander, seeing the evil which plagued Lut Gholein muses that Tal Rasha's battle against evil was lost. Likely Tal Rasha's face cut and attached to Baal's head. The entry chamber to get to the Chamber of Tal Rasha, AKA Duriel's Lair. The Binding Stone that held Baal. Diagram of Baal's/Tal Rasha's face. The Diablo II Act II monster called Greater Mummy and related mummies can sometimes be heard saying "Tal Rasha". This page was last edited on 27 August 2014, at 22:29.